Hallowe’en night on ye olde labour desk at the Vancouver Sun. Gosh, I could use that costume today and scare the bejeezus out of people. “Run for the hills, Martha! 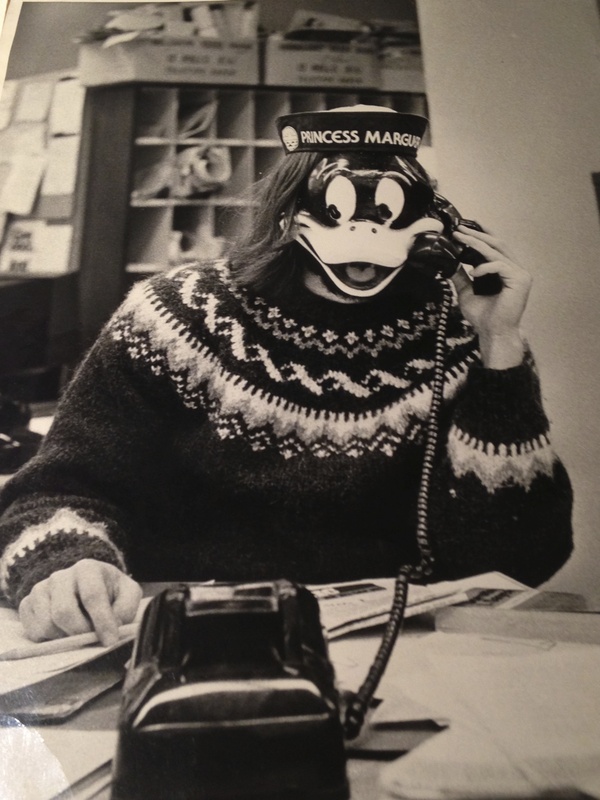 It’s….a labour reporter!” Bwuhuhuhaha…..
Any journalist who had occasion to deal with Musqueam Chief Ernie Campbell knew him as gruff, to the point, and without much patience for mealy-mouthed media questions, such as “why are you so tough on those poor, non-native leaseholders?” He rarely returned calls. Those same reporters were regularly baffled when the Chief’s persistent political rival, former chief and media-friendly Gail Sparrow, would get trounced every time she ran against the taciturn incumbent, despite all those allegations of skullduggery she would launch in every direction. 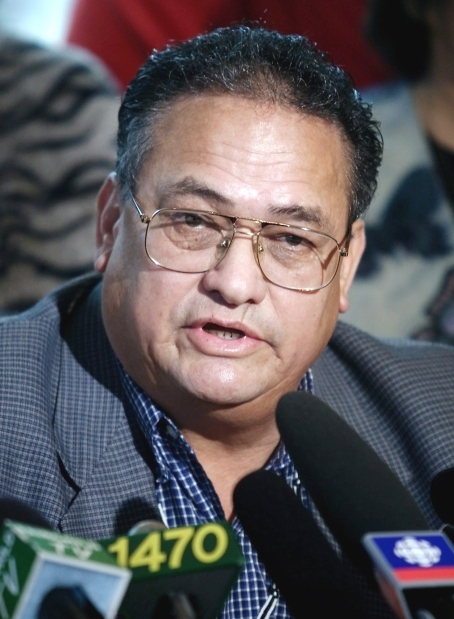 During his 14 years at the helm of his people, Chief Ernie Campbell was one tough nut, a warrior at the negotiating table and in the courts, who rarely came away from any dispute without carving another notch in the Musqueam arsenal of rights. But the hundreds of mourners gathered Wednesday morning to pay respects to the veteran chief, who died last week from diabetes complications, heard about a different Ernie Campbell, or “Big Ern”, as he was known to many on the Reserve. While the walls carried pictures of Chief Campbell meeting the likes of Arnold Schwarzenegger, members of the British royal family, Emperor Akihito of Japan, IOC president Jacques Rogge and our own political leaders, most of all he was remembered by those close to him as a family man, as a dad. His three daughters and one son each paid their own emotional, teary tribute to a father they said they would miss forever. He taught them so much about life. A moving video shown at the end of the long, moving service had barely any photos of Chief Campbell doing his work as Chief. Instead, they showed him with his wife Carol, his kids, his grandkids, with friends, almost always with a big rumpled grin on his face — at home, at the lake, on holiday, by the Christmas tree, and blowing out candles on innumerable birthday cakes. At the end of it all, as a Musqueam Warrior Song escorted his flower-draped casket out of the gym, it was hard to imagine anyone leading a more complete life than Chief Ernie Campbell, dead too soon at 72. 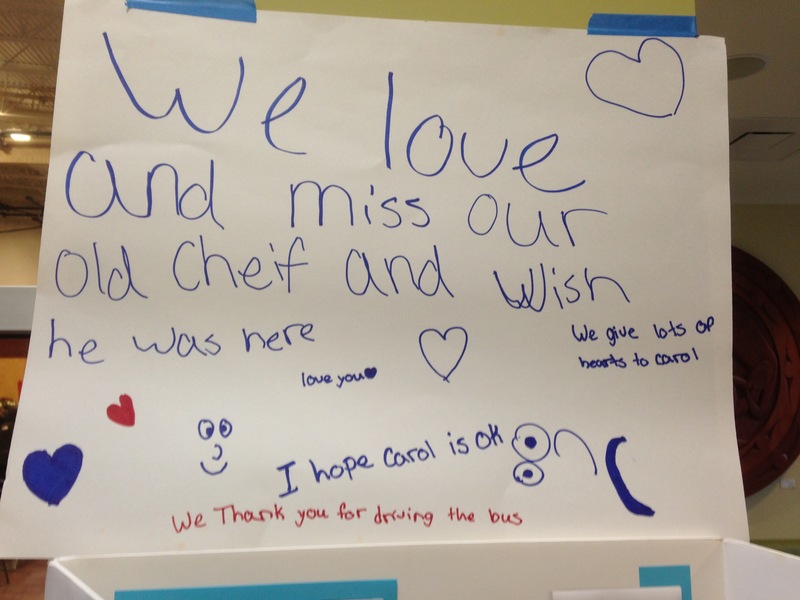 And a nice piece here by the CBC’s Dan Burritt on Wednesday’s memorial. Recommended. 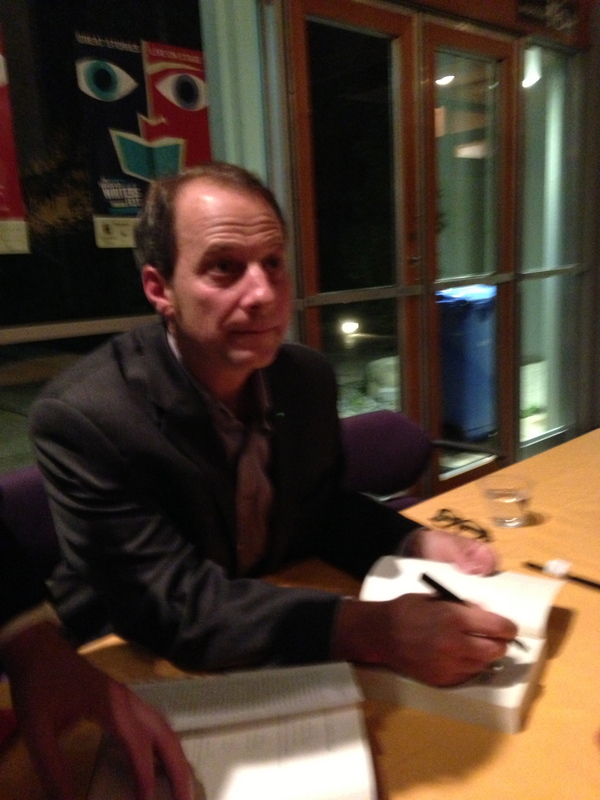 The other night, I wandered through the dark, foggy campus of the University if B.C., replete with cautionary signs to men about treating women right, to hear George Packer, superb chronicler and feature writer for The New Yorker magazine. 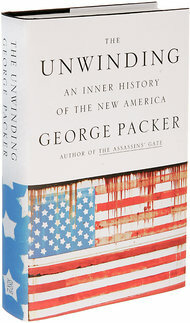 Packer was there as part of this month’s Vancouver Writers Fest to talk about his latest book, The Unwinding, a best-selling attempt to get at the root of what the heck has gone wrong in once-mighty America through a series of individual profiles. Five are exhaustive looks at four “ordinary” people we’ve never heard of, plus PayPal mega-zillionaire Peter Thiel. Those are interspersed with 10 shorter vignettes of the more prominent, from Oprah to Newt “Eft” Gingrich to Walmart founder Sam Walton. An engaging, pleasant-looking fellow with thinning hair, Packer oozed sympathy and respect for his struggling countrymen, while barely disguising his loathing for the excesses of those at the top. Packer pinpoints 1978 as the start of the great USA decline. That’s when infamous Proposition 13 passed in California, keeping taxes so low that almost anything good could no longer be adequately funded. The state has since gone from having the country’s best public education system to one of the worst. He reserved his harshest criticism for the zealots who appear to have captured the Republicans, once a mainstream political party, slightly to the right of centre. Nor is Packer, who is not nearly so gloomy in person as his message, a fan of the great moguls of social media. “I’m skeptical about Silicon Valley and their effect on our country. At least with the oil and gas companies, you know what they’re after,” he said. “To me, the smiling face on Facebook is scarier than Exxon Mobil.” That’s a pretty interesting thought one week from Hallowe’en. Packer subtitled his book “An Inner History of the New America”. Recommended. In 1975, Red Sox catcher Carlton Fisk hit one of the most famous home runs in World Series history, standing at home plate, waving the ball fair – by inches—as it hurtled through the Fenway night. His homer came in the bottom of the 12th inning of a do-or-die game for the Sox against the powerful Cincinnati Reds. For years afterwards, Fisk refused to watch replays of his heart-stopping blow. He wanted to remember the moment, exactly how he felt and what he saw during those magical few seconds that catapulted him into baseball lore. The more you watch a replay, Fisk felt, the more it blurs the actual event in one’s mind. Instead of what really happened, one remembers the ubiquitous replay. That’s how I feel right now about Saturday night’s unforgettable ending to the game between those same Sox and the hometown St. Louis Cardinals. A walkoff obstruction call. Who’s ever heard of such a thing? Certainly, nothing like it had ever happened before in the 110-year history of the World Series. I want to remember how it was to watch that sizzling series of events unfold in little more than a twinkling of an eye. Rooting for the Red Sox, I was already on the edge of the couch, with the game tied 4-4 in the last of the ninth, runners on second and third and only one out, as Uehara pitched to Jon Jay (why didn’t they walk him? )…..Shades of Casey at the Bat: Jimmy safe at second and Blake a-hugging third…. In a flash, Jay hits the ball hard, Pedroia dives full out, snares it, scrambles to his feet and throws home, as tattooed Molina lumbers towards the plate. My first quick thought: would the catcher, with the unlikely name of Jarrod Saltalamacchia, make the tag? Yes! O joy! Then, what the heck!? Saltalamacchia immediately throws to third in a risky attempt to nail the ailing Craig, already sliding for the base. The ball sails into foul territory. That’s it, the game is over. But wait. Somehow, Craig trips, Nava hustles after the wayward baseball, throws home, and it’s actually going to be close. He got him! Craig is surely out! Extra innings. More joy! But wait, again. What’s that weird signal from the home plate umpire? He’s not calling safe or out. He’s waving his arms, as if it’s over. Leaping, chirping Cards are suddenly swarming the field. What on earth is going on? All this drama unfolded in just a few fleeting seconds. As for me, I will try to retain instead those precious moments when all hell broke loose, with the game on the line, the ending uncertain, and my emotions racing up and down like an out-of-control roller coaster. For the umpteenth time, I give thanks to the great Umpire upstairs who made me a baseball fan. It’s too bad that British Columbia’s most valuable guardian of the efficacy of new prescription drugs wasn’t called something grabby, like On Your Side or WatchdogBC. That might have slowed or even forced a halt to the seemingly methodical quest by the Liberal government to weaken its role and smooth the path of drugs to the province’s PharmaCare program. As it was, the public found it hard to rally behind a review panel with the unhelpful title of Therapeutics Initiative. What the heck was that? 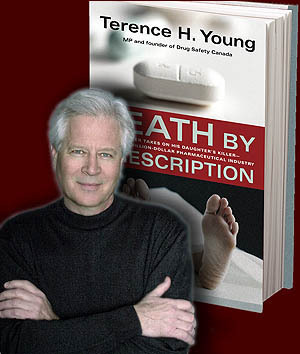 No matter that its cautious approach to greenlighting drugs had saved hundreds of millions of dollars and many lives over the year, plus contributing to B.C. spending less per capita on prescription drugs than any other province in the country. Whenever the Therapeutics Initiative (TI) was raised as an issue, eyes of the public and editors would mostly glaze over, waiting for a return to pipelines or ferries or the miracle drug LNG, something that fit easily into an understandable headline. But ‘big pharma’ certainly knew what it was, as did public interest advocates across North America, loathing and loving the Therapeutics Initiative in equal measure. The TI is a group of independent, research-minded faculty members at UBC’s School of Medicine. 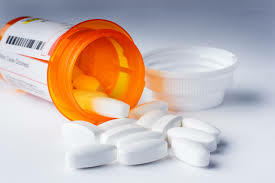 Since 1994, they have had the task of scrutinizing the cost and health benefits of new, often-expensive drugs promoted by brand-name pharmaceutical companies and assessing whether they should be covered by PharmaCare. Much to the annoyance of the drug companies, the TI regularly took its time. There was no rush to judgement. Nor was the TI shy about questioning, when warranted, the purported value of the latest ‘breakthrough’ drug. Their caution led to far less use in B.C. of several drugs that were subsequently withdrawn from the North American market after causing numerous deadly side-effects elsewhere. In 2008, however, as large political donations from the pharmaceutical industry piled up, the ruling Liberals began to take aim at the Therapeutics Initiative. Following the recommendations of a faux task force with strong drug company representation, the TI’s funding was slashed by nearly 50 per cent, while more and more drugs were referred to the Common Drug Review in Ottawa. Those in the health ministry who understood the agency’s worth were silenced. Not only did these pleas fall flat, the situation got worse. Just over a year ago, the TI’s remaining annual funding of $550,000 was cut off completely. The government blamed an alleged privacy breach among its health research staff and a resulting freeze on distribution of data. That left the TI, which was not involved in the case at all, with almost nothing to do. Many saw this as a convenient excuse for the Libs to kill off an operation that was far too independent for their liking. Neither Premier Clark nor Health Minister Terry Lake did much to counter that view. Finally, with the departure of Gordon Campbell-appointee Graham Whitmarsh as deputy health minister and the fine Stephen Brown in his place, the government listened. Health Minister Terry Lake announced this week that the Therapeutics Initiative would be resuming its valuable work. The $550,00 was back in place. Sometimes the good guys win. Even in politics. It has never ceased to astound me that so many health care workers refuse to get an annual flu shot. We’re not talking about that small, cranky minority of Canadians who dispute all vaccinations, including those for their young children. These are individuals on the frontlines of caring for vulnerable patients, and every year, upwards of 50 per cent of them simply decline to be vaccinated against influenza. Some wear a mask instead, but not many. In vain have public health officials, hospitals and long-term care facilities rolled out education campaign after education campaign, stressing the value of flu shots in preventing the spread of a potentially serious, even fatal, condition to those they care for. Vaccination percentages in health care settings remain stubbornly low. Reasons vary, but mostly they boil down to protecting the right to decide what goes into one’s body, and questioning whether vaccinations do much good. Indeed, the effectiveness of flu shots is relatively low, compared with vaccinations against other diseases. But public health officials are unanimous that they still offer the best protection there is against the spread of influenza. Having a flu shot provides more protection than not having one. Yet, vast numbers of health care workers continued to go unshot. Finally, B.C.’s Provincial Health Officer Dr. Perry Kendall and others in the field decided something more had to be done. Last year, they unveiled a policy that mandated all health care workers in contact with patients to be vaccinated against influenza, wear a mask, or face the possibility of discipline. 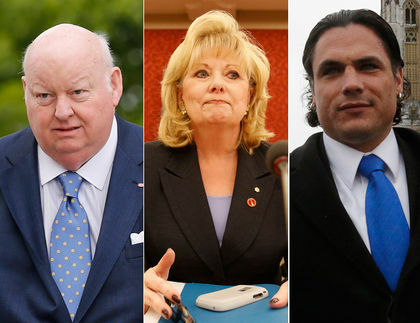 This province-wide dictate was the first of its kind in Canada. Not surprisingly, health care workers and their unions strongly opposed the get-tough measure, prompting the province to withdraw the proposed policy and institute, temporarily, a more collaborative approach. Meanwhile, the matter of mandatory flu shots or mask wearing went to arbitration. Today, following 15 days of hearings, involving international and Canadian public health experts on both sides, including the renowned Dr. Allison McGeer, director of infection control at Toronto’s Mount Sinai Hospital and advisor to the World Health Organization, we have a verdict. In a comprehensive, 115-page judgment, Robert Diebolt, law professor emeritus at UBC, ruled that, given all the evidence, the policy of compulsory immunization or mask, while not perfect, was reasonable. This is a victory on many fronts: for patients, for common sense and for sound public health. I hope those reluctant health care workers now get the point! Rather than accept my word for it, however, here is Professor Diebolt’s ruling, in its entirety. Happy reading. I haven’t been to a world premiere since my hometown Newmarket Citizens’ Band unveiled The Newmarket Era and Express March one lovely Sunday ages ago in the park. So it was a big thrill to be at another premiere on Saturday, in this case, the first public performance of a new composition by the renowned Philip Glass. Nor was it just some ditty, if I can use that word when dealing with serious music (I do note that Glass has cooperated in the past with the likes of Mick Jagger…). This was a satisfying, 30-minute work, String Quartet No. 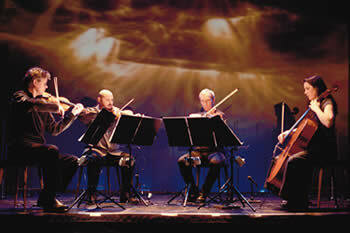 6, performed by the eclectic Kronos Quartet at the sold-out Chan Centre, designed to mark the Quartet’s 40th anniversary. Even better, in an undertaking both bold and risky, Glass was co-commissioned to write the piece by the Chan Centre, itself, through UBC’s Faculty of Arts. How cool is that? Vancouver is now on the global cultural map for more than Mr. Peanut. As for String Quartet No. 6, Glass said, with a mischievous smile: “I knew I was giving them a piece that was difficult to play. And it was.” To these unsophisticated ears, however, it sounded smooth as, well, glass. Variously soothing, spirited, and always spell-binding. The multi award-winning Kronos Quartet seemed thrilled, too. When I asked Harrington whether String Quartet No. 6 has now found a place in the Quartet’s permanent repertoire, he responded: “Oh, yes. We’re playing it at our next concert, in Las Vegas.” I checked the local media. The Las Vegas Weekly headlined their coming performance as one featuring “the U.S. premiere of Philip Glass work”. Hah! Score one for the Chan. All in all, it was certainly worth missing Prince Fielder’s thundering, lugubrious, third base belly flop, at just about the time the Kronos Quartet began playing. 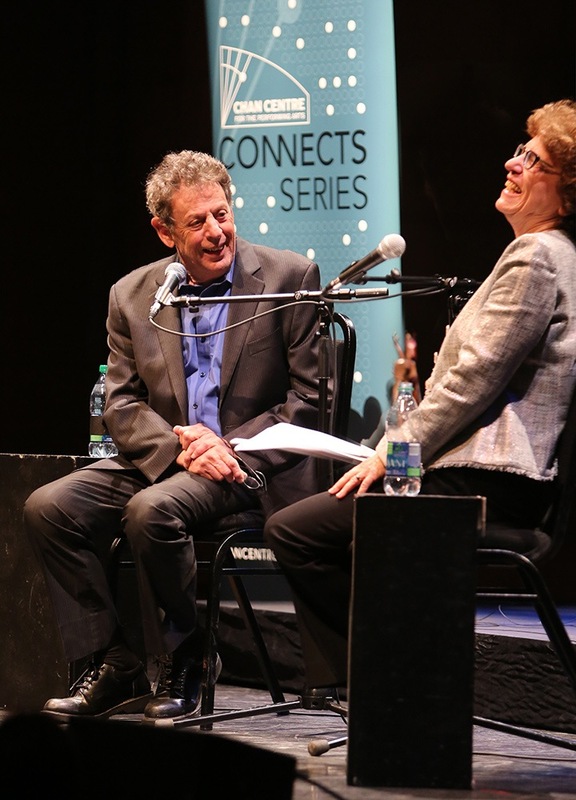 Below: Philip Glass and Eleanor Wachtel enjoying each other’s company on Saturday Night Live at the Chan. Photo by Tim Matheson.